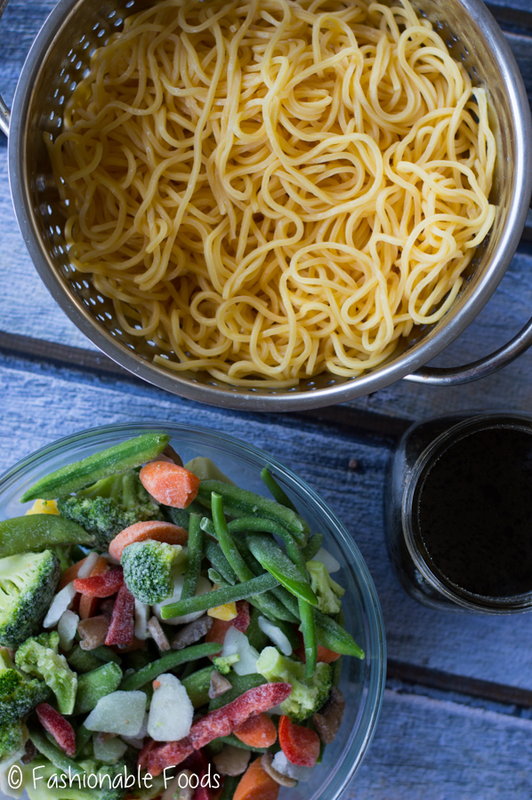 A takeout favorite made at home, this easy lo mein can be made in 30 minutes and you can use whatever your favorite protein and veggies are! 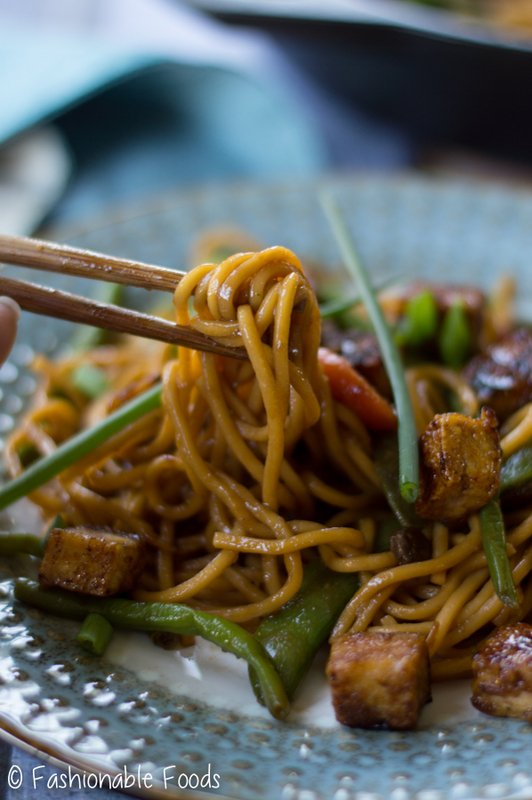 Lo Mein is one of my favorite takeout dishes and I’ve tried for years to recreate it, so this recipe has been a long time in the making! One of my pet peeves about takeout lo mein is there’s never enough protein/veggies tossed in. It ends up being all noodles, which don’t get me wrong, I love me some noodles. But, when I get lo mein I want it to be my main dish, not a side. I want some substance in there! 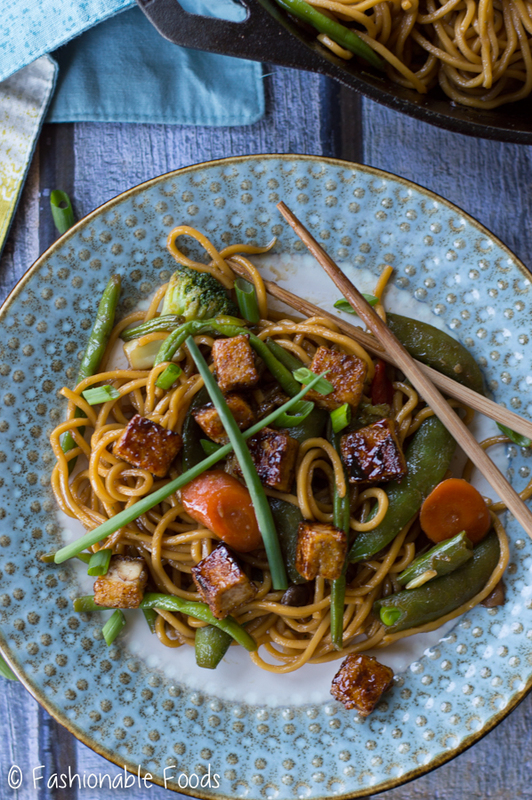 That’s the great thing about making your own takeout at home – you can make it however you like! I’m not kidding when I say I’ve been attempting at home lo mein for years. I really amped up my attempts a few months ago when all I craved was lo mein. I didn’t really have many pregnancy cravings, but Asian food was something I wanted all the time and eating takeout lo mein all the time wouldn’t have been my best idea. 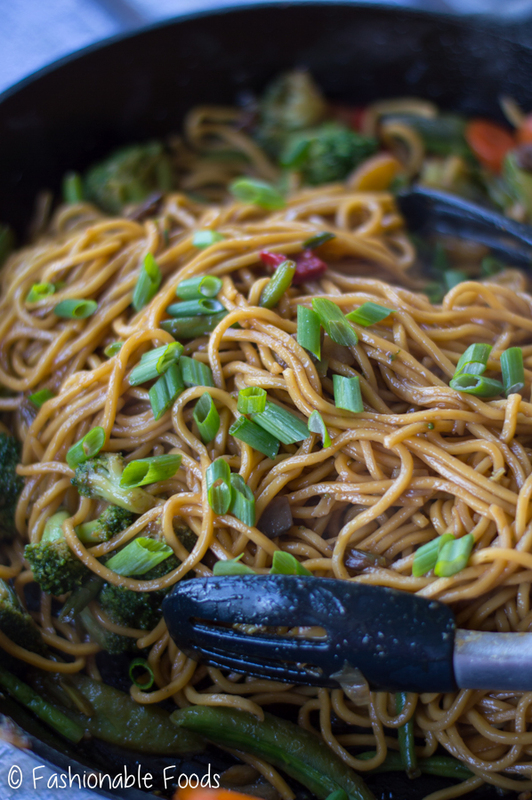 So, I set out on a mission to come up with my idea of the perfect at home lo mein. 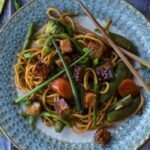 I tinkered with the sauce constantly, tried different protein and veggies combos and I tried every lo mein noodle I could find. Seriously, I grabbed every package of noodles I could find at every grocery store I went to. I even made my own! Yes, I made homemade chinese egg noodles, which I have to say were the best. Obviously making homemade noodles isn’t practical (although fun when you have the time! ), but you can buy fresh Chinese egg noodles in some stores. If you can find them I highly recommend them. There are plenty of dried options out there and they all work just fine! Now that we have our noodles, let’s talk about the sauce. It’s really simple to make – just toss all the ingredients into a jar with a tight fitting lid and shake it up. As for the protein and veggies, use whatever you like and have on hand. 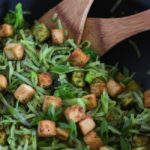 I’ve used everything from a mix of fresh green beans, peppers, and cabbage to a frozen stir-fry blend. The frozen blend makes it incredibly easy since you don’t have to spend the time chopping! 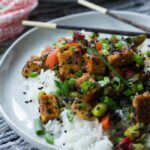 I went with crispy tofu for my protein, but chicken, shrimp, pork, or beef all work. You can also keep it all veggie if you like. 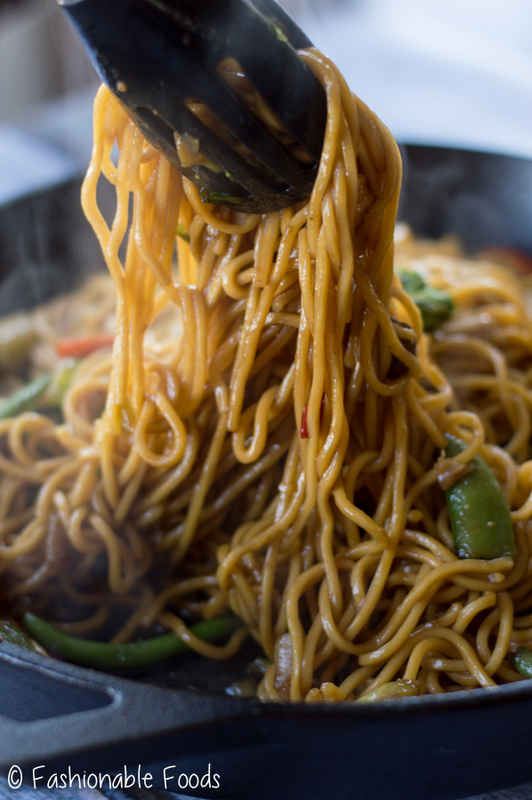 No matter what you choose to add to your lo mein it’s going to be delicious. Plus, it comes together in about 30 minutes so you can enjoy it any night of the week! Combine the sauce ingredients into a jar or container with a tight-fitting lid. Shake well to combine. Bring a large pot of water to a boil and cook your noodles according to the package directions. Drain and set aside. Meanwhile, heat a large skillet or wok over high heat and cook your desired protein in peanut oil until browned and cooked through. Transfer to a plate and set aside. Add more oil if needed and to that the white part of the scallions, garlic, and ginger and sauté for about 10 seconds. Add in your vegetables and sauté until crisp tender before adding the protein back in. Toss the protein and veggies with the cooked noodles and then pour in about half of the sauce. Toss well, adding more sauce as necessary to coat everything. Pile the lo mein into bowls and top with the green part of the scallions for garnish. Enjoy! 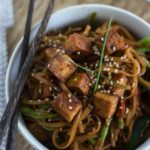 *I add the peanut oil into the sauce because it gives the sauce a similar consistency as takeout lo mein, but it’s not necessary! 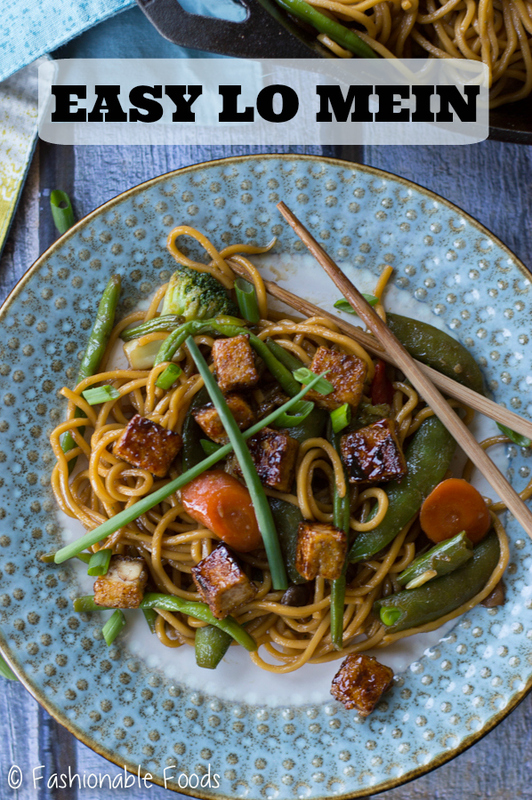 *Fresh Chinese egg noodles (I found mine in the freezer section at Wegmans) are amazing in this and the closest you’ll get to the takeout version of lo mein, but if you can’t find them dried works just fine! I have used many different varieties and I love them all. 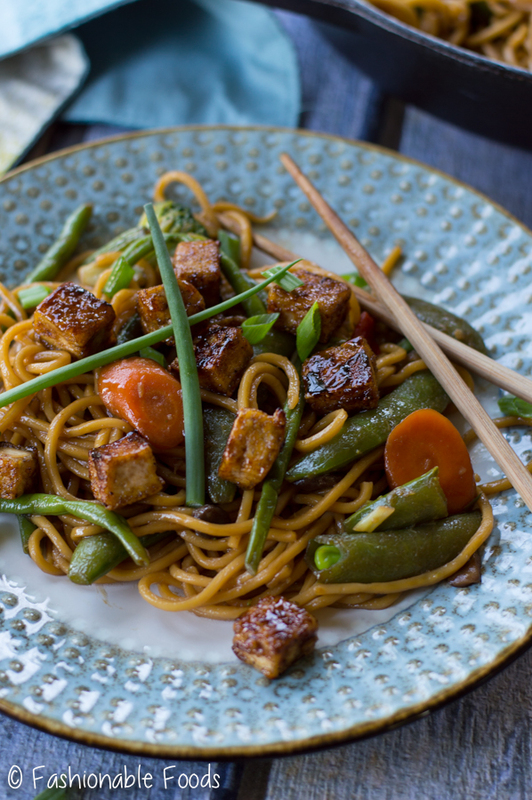 *I like crispy tofu in my lo mein, but anything will work here! Chicken, pork, beef, or shrimp would all be fantastic. Just cut whatever you chose into bite-sized pieces and season well with salt and pepper before sautéing.